"Our brother Joseph is at peace." Ten years ago this morning, that was the word from Chicago, where its eighth archbishop had succumbed to pancreatic cancer, aged 66. 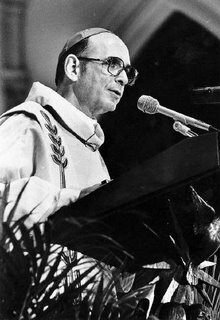 Those who loved him wish he were still here to lead them; those who didn't wish he were still here to serve as their bogeyman, but both schools of thought speak to the same reality: Joseph Louis Bernardin was a titanic figure of the post-conciliar church in the United States. "I hope that long before my name falls from the eucharistic prayer in the silence of death you will know well who I am. You will know because we will work and play together, fast and pray together, mourn and rejoice together, despair and hope together, dispute and be reconciled together. You will know me as a friend, fellow priest, and bishop. You will know also that I love you. "For I am Joseph, your brother." If any presbyterate heard words like that these days, they would need to be assured that they weren't having delusions. Then again, the first American cardinal created by John Paul II had a curious knack for being ahead of his time. What is more, far beyond the confines of the archdiocese he loved, many found in his example a template of how to live and how to die, how to believe and to serve, and the importance of being mindful both of the scourge of war and the challenge of peace. Arguably, however, Cardinal Bernardin's greatest institutional legacy was in the episcopal conference, which he served as its first general secretary, as vice-president and, from 1974-77, its president. His advocacy for issues of human life and the Catholic mission in all its concerns is reflected still in its approach. It's another one of those great ironies, however, that on this anniversary, faced with exigencies unimaginable but a decade ago, the same conference -- led through its darkest days by one of his episcopal sons -- faces a vote to significantly curtail the structures whose building he championed. Toward the end of his life, the man whose mother told him at his episcopal ordination to "Stand up straight and don't look so pleased" sought to take on one final ad intra concern. The term "common ground" may now be viewed by some as overly evocative of an ideological pole, but the importance of unity in the church that the term represents has become even more of an imperative in ecclesial life in the years since, particularly as the consequences of a divided secular polity in the United States have seeped into the life of the Body of Christ. Yet again, the man was ahead of his time, but the work of unity -- which Benedict XVI termed the "will" of the Holy Spirit on the vigil of Pentecost -- belongs not to one prelate, diocese or faction, but is the mission of the whole church. Structures rise and fall, but communion remains -- or, at least, is supposed to. And that's not something ten years can change. Pro Ecclesia in DC: Che Gioia!